This is a cross post for one of my original blog posts on DIY Drones. It is included here for permanent reference. Until recently my main TX was a Turnigy 9X and I (like many others) was using a hacked in 6 position POT switch to select modes on my various aircraft. Unfortunately the 9X has died so has been replaced by a shiny new 9XR. Rather then hack apart the 9XR (too pretty) I wanted to experiment with using the existing controls to select modes on my aircraft. I have seen several tutorials on this but none met all of my requirements below. The method I used was to combine the 3 position switch (ID0/1/2) with the Aileron Dir switch. 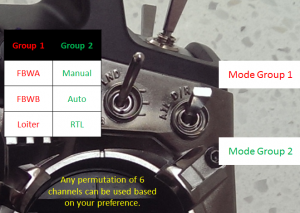 Between these two switches there are six possible combinations which neatly matches the 6 modes of the APM ecosystem. One of my passions is UAVs or drones of which I’ve built a number. Over the past year I’ve been working with a local team of fellow enthusiasts preparing an entry for the 2016 UAV Medical Express Challenge. The competition involves a simulated scenario where teams must send an unmanned, autonomous aircraft a substantial distance (10-30km) away to locate a person who is unwell. Once located, an aircraft must land near the unwell individual and a blood sample will be placed in the aircraft. Next, the aircraft must autonomously take-off and return back to the launch site where that sample would be “tested” to help diagnose and treat the simulated casualty. In September 2016 we received a “go” decision from the judges to proceed to Deliverable 2 where we must demonstrate our capability to complete the challenge. We submitted this yesterday and from here the judges will short-list the 20 teams that will get to attempt Deliverable 3 and enter the competition. This challenge is an exciting opportunity to demonstrate the abilities of technology for doing good in our world. The fact we can develop this on tiny budgets with a DIY approach is a real testament to the amazing world we all live in.